Is there any greater sign of awards season than a new historical drama from Steven Spielberg? Though he's perhaps better known by the public for his more contemporary - or futuristic - populist entertainments, it's his period pieces that have the greatest track record with the more "highbrow" Academy voters. His latest, "Bridge of Spies", looks backward to the Cold War era, joining forces with the Coen brothers for a film extolling the virtues of America and humanity at large. And like most of the "Oscar bait" packages delivered by these esteemed filmmakers, it's worthy of our consideration. 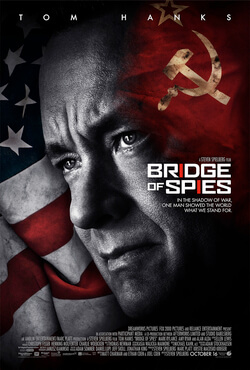 Based on the true story behind the 1960 U-2 incident, "Bridge of Spies" follows an insurance lawyer named James B. Donovan (Tom Hanks) who unwittingly gets thrust into the middle of the Cold War. 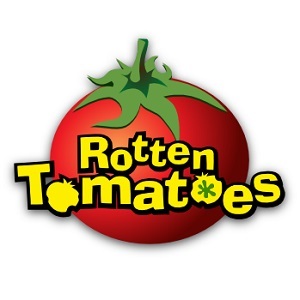 The film begins with Donovan being entrusted with the defense of Russian spy Rudolf Abel (Mark Rylance), in an effort to portray America as a place of fairness with regards to the law. But when Donovan takes his task seriously, he quickly becomes scorned as a traitor to the anti-communist cause. As an American pilot soon finds himself in a similar situation on Russian soil however, Donovan's unwavering empathy becomes crucial to negotiation efforts. And eventually, he is called up to spearhead a complicated POW exchange, which will take him from his quaint suburban life to a faraway land. With the US government unable to publicly acknowledge the mission, Donovan is promised no reward or recognition, aside from the satisfaction that he's doing the right thing. If you've looked at my personal Top 50 films, you'll notice that "To Kill A Mockingbird" ranks near the top of my list (in addition to some other Spielberg titles littered throughout). As such, I'm naturally predisposed to appreciating a film like this, where one man's humanity shines through in an intolerant society. It can fall apart as schmaltz in the wrong hands, but when done well, it provides gratifying cinema. This is one such instance where the formula is configured correctly. As I watched the film, I was reminded of a recent episode of the Fighting In The War Room podcast, where the hosts played a game based on Spielberg's filmography. Interestingly, it was based on his career as a producer, not a filmmaker. And in thinking of "Bridge of Spies", I realized that our idea of Spielberg as a filmmaker owes as much to his producing skills as it does his directorial style. Simply put, the strength of Spielberg's oeuvre can be attributed to not just his talent, but his ability to assemble some of the most gifted artists to work with him. And indeed, "Bridge of Spies" turns out to be one of the most well-produced films of the year. When it comes to production values, there's hardly a film that can touch it. From the warmly lit cinematography of Janusz Kaminski, to the eloquent screenplay from the Matt Charman and the Coens, to the exquisite detail of the production design, everything is in place for classic filmmaking at its finest. As such, you can expect the film to be in the awards conversation for Best Picture, Best Director, Best Original Screenplay, Best Editing and Best Production Design. And in the lead role, Tom Hanks captures the kindhearted demeanor of the Gregory Pecks and Jimmy Stewards of times gone by. But the standout is certainly Mark Rylance, whose wonderfully subtle performance will surely make him a contender for Best Supporting Actor. Perhaps even more so than Hanks, he best represents the film's tone and message. Admittedly, "Bridge of Spies" is uncharacteristically quiet for Spielberg, lacking the usual emotional impact (John Williams' typically rousing compositions are sorely missed) of his best work. But like Rylance's pragmatic Rudolf, the restraint works for the story, taking an evenhanded approach to what could have easily been jingoistic propaganda. Ultimately, "Bridge of Spies" is a tribute to the unsung heroes on both sides of the war, the ones who you wouldn't even notice if they sat in front of you on your daily train commute. And in doing so with such refined artistry, it commands your respect. Great review. i didn't realize that the Coens had co-written it. I've got to see it now. Wants to know about A true comedian of American? Visit our website.